'1960 - 1995 Born healthy in Palo Alto California with an identical twin brother. Moved around the San Francisco bay area a lot in the 60's because of dads work. Brother and I were on billboards across the country end of 1965 for 66 Ford Fairlane. At age 15 in 1975, I got into theater technician work for a repertoire group my dad was in. In 1978 made 2 short super 8 films in high school. Moved to L.A. in 1983. Married in 1987. Moved to Oregon then Atlanta. Divorced in 1991. Upsetting, but not a traumatic kind of thing some people associate with autoimmune issues. 1995 start work at Seaworld as a pyrotechnician setting up nightly fireworks... the beginning of my exposure to the heavy metals used to achieve the colors in fireworks. 1999 switched over to Universal studios. Still a pyrotech, but working with stage pyro, rock n roll kind of stuff... and setting a stuntman on fire with Coleman camp fuel (naphthalene). 2002 Strange symmetrical itching begins. I pass it off as the allergy to Florida. 2005 While staying at a hotel while house was being repaired from hurricane damage, I noticed under the white fluorescent lights in the room how discolored my skin was getting on the chest and lower back. Didn't see it so much in the orange incandescent lights at home. Went to primary care doctor who did a biopsy and diagnosed scleroderma from the overproduction of collagen. Further blood work and muscle biopsy confirmed. ANA tests negative. Stopped working with pyro... moved within Universal to video editing. 2006 The year of getting weaker and weaker and the people saying “you don’t look sick” phase. 2007 In March I suddenly could not play various chords on my guitars any more. 4 months later arm muscles shrank; hands could not turn palm up; hands curled in tight. The last year of being the proper 175lbs for my 6' 0" height. 2008 In January, a year after my doctor at that time told me I should stop working, I stop working. Not because of the hands, but the unpredictable bathroom runs. It went on to be wonderful year of constant diarrhea and vomiting. Can only eat eggs, oatmeal and unsweetened apple sauce. Made the big mistake of eating lots of store bought yogurt. All the sugar just made things worse with the bacterial overgrowth. Methotrexate stopped for not doing anything other than giving me a stomach ulcer. On SS disability in August. 2009 All the dehydration from the diarrhea made for constant low electrolytes. In November I go into ventricular tachycardia. Pass out on way to hospital nearby and wake up in big hospital uptown. I had to be zapped while I was out. A week later I get an implanted defibrillator (dubbed Sparky by my brother) and meds for the heart. They find and remove 9 feet of perforated small intestines. They made some bad medication decisions though as when I got home, I went into nonstop v-tach where my defibrillator shocked me 10 times till things settled down in the ambulance... meds fixed it up after a night in the hospital with some of the most messed up dreams ever... that I still remember… all was good, for a while. While I have always eaten well, like many, I still had sodas and junk food treats and alcohol. This is the year I put a stop to all that. Not all in one day, but within the year. Unfortunately the heart meds started to lose their effectiveness. Starting November, I'd have v-tach, get shocked, go to hospital, get released... repeat. 2012 The v-tach/shocks continue. Had a hard time convincing the local hospital to send me to the big one, I start having my neighbor take me straight to the big hospital uptown where I played the staff there till I got the same brilliant ep cardiologist that saved me in 2009 (turns out he's one of the best in the world). I remain in that hospital for the entire month of March as it takes time to schedule out what he plans to do with my heart. In the first week, before the ablation procedure, I go into an unstoppable v-tach. Zap after zap. The heart rate goes so high the heart stops moving blood (heart just undulating) code blue, cpr, paddle shocks. Sparky can only shock 6 times in a row till it has to recharge like an old flash unit. I wake up out of it unable to speak clearly for 20 minutes… 20 minutes of thinking that might be permanent. Now the doctor realizes he must do ablations in the heart, but also knows I will probably go into v-tach when the catheters reach the inside. He wants to send me up north to a specialist he knows... denied by medicare. He plans to bring in an additional doctor that is an expert with the impeller pump. A tiny pump that goes up the leg artery into the heart, opens up and will keep blood flowing (though very slowly) should the heart undulate again unable to pump blood. The doctor tells me despite all this "you could die" I say "if we don't, I WILL die". We do the deed. Sure enough, the pump was needed, he ablates 2 spots to correct the symmetry of the heart's electrical field... success... Unfortunately, ablating some spots can sometimes cause the need for ablating another. The very next morning, nonstop v-tach again. No need for cpr this time, but shocked just as many times. The amiodarone/lidocaine cocktail they push into my picc line makes the world a groovy place despite all the mayhem happening around me. By this time I have lost count of how many times Sparky has had to shock me. Another ablation is scheduled. Sure enough, the pump is needed again. One more spot ablated... and he also kills the AV node making the heart a slave to the pacemaker/defibrillator he decides to replace Sparky with. Waking up from being on the table for 6 hours (much of that time with the slow blood flow of the pump) was the strangest experience I can’t really explain... but there they were, fluorescent lights in the ceiling "I'm still alive!" as I’m sure there are no fluorescent lights in heaven. The next day, I get the docs team to laugh when asking about old Sparky. I asked "was it all blued like motorcycle pipes from going off so much?" After all that I was down to 93 lbs. I decide not to go straight home. I check into a nursing home for a month and a half rehabilitation. In the meantime, my 3rd and best rheumatologist, who I made my primary care dr., has been receiving copies of records generated by that month in the hospital. She notices the blood work, except for some vitamins and minerals has become normal. I made arrangements with 2 long time friends in need to move into one of my spare rooms at home. Because of the good blood, we decide to stop prednisone. We aren't using the word remission at this point, but I start a new calendar... year one. Early 2013, I finally get the hernia repair surgery… no issues. Slowly but surely I regain some strength and weight. That thin lip portion starts going back to normal. The greyish brownish skin of 2005 is gone. Was it the heavy metals and naphthalene? Both have been associated with autoimmune issues. There is no test… no way to ever know for sure. 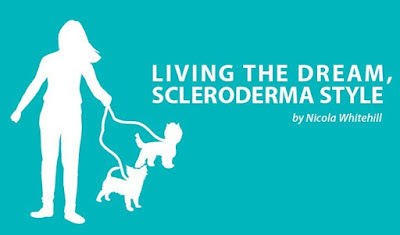 None of my former co-workers have come down with scleroderma because they don’t have my genetics. My twin brother who does have my genetics has never worked with pyro… and I won’t ask him to do so to prove my theory. By 2016 there had been no new issues, no v-tachs or shocks and normal blood. No more Raynaud's reactions. We now use the word remission. At the end of 2011, I joined a scleroderma forum to hang with others facing the challenge. My rheumatologist is also a professor at UCF here in Orlando. 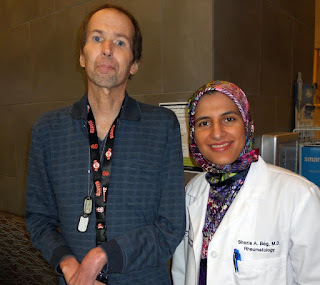 Starting at the end of 2012, she has invited me every year to help with her scleroderma presentation to her med students. It is pay it forward from here out. I still deal daily with the damage done. The heart has been good but there will always be PVCs (palpitations) and flutters. Hands have loosened a lot but still cannot turn palms up. I'm topped out at 125 lbs. As good as I'm eating, it's hard to compensate for that missing length of intestines. I look now to the future of stem cell muscle regeneration to truly repair my damage. In all modesty, I have never dealt with depression through all this. A positive outlook seems to be my default setting… much like that of animals… everyone has seen a 3 legged dog, but no one has ever seen a depressed 3 legged dog. I remain in remission, but still deal with the damage done. Damage to muscles, digestion and heart. The muscles will have to wait for future muscle regeneration break throughs. Not enough strength to go back to work as loading the dishwasher is exhausting. I stay busy with hobbies, friends and eating many small meals a day instead of 3 big ones. While I have only been seeing my current GI Dr. since last year... and since being in remission, we are working together to see what we can do to make my damaged digestive system work better as it is missing 9 feet of small intestines. She is quite good... more knowledgeable about scleroderma than my previous 2 GI docs. 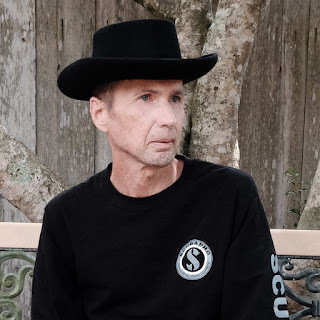 A BIG Thank You to Roy for sharing his amazing and miraculous personal experience with scleroderma. Click here, to view the UK Scleroderma Study Group Guidelines for Cardiac Management in Scleroderma.